One of the interesting details of prototype waybill procedures was the handling of private-owner cars when they had been made empty. Foreign railroad-owned cars (that is, owned by another railroad) which were made empty were either returned to the railroad on which they were loaded, via the service route, or “confiscated” locally for loading, or returned to owner if a direct connection existed, but private cars were different. They were naturally under the direction of their owner, and could be sent wherever specified by the owning company. There is an allusion to this in my prior post about waybill preparation, roughly midway through that text, describing handling of an empty GACX covered hopper. (That post, quoting extensively from Harry Dolan, is at this link: http://modelingthesp.blogspot.com/2013/06/waybills-29-waybill-preparation.html .) 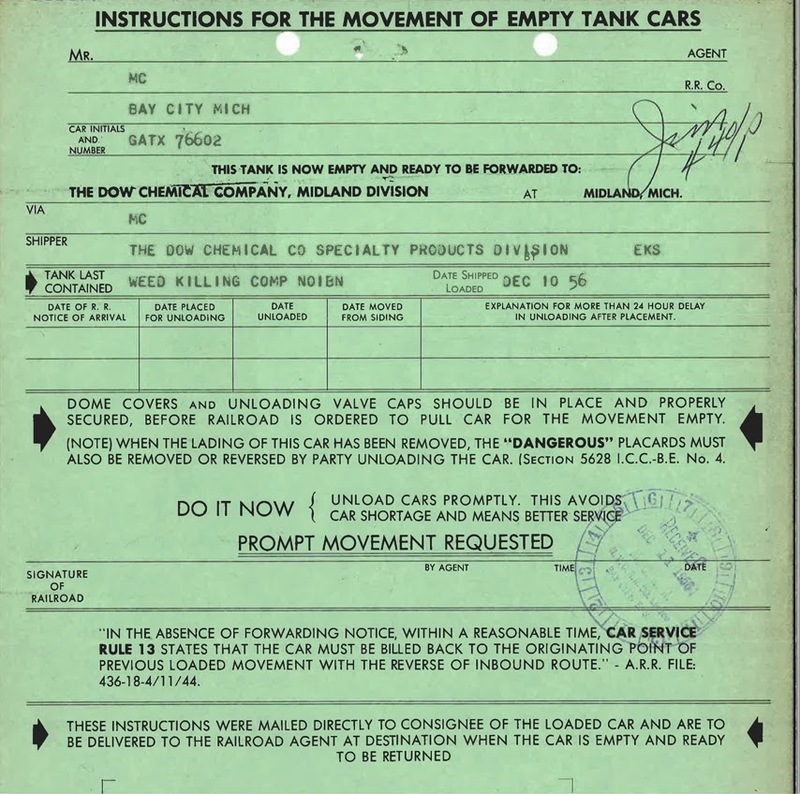 Recently I received a copy of a 1956 document directing such an empty car movement, from the collection of Geoffrey Barbier, sent to me by Tony Koester. It’s shown below; you can click on it to enlarge the image. The document was issued by Dow Chemical Company, Midland Division, and directs the return of empty GATX 76602 (presumably a leased car) to Midland, Michigan. The body of the document is to some extent self-explanatory, but let me make a few comments. Both the destination and the present location of the empty car are shown, as is the former cargo, weed killer (identified for safety reasons). As stated at the bottom of the notice, this document was sent to the consignee of the loaded car, and was to be handed to the local railroad agent, who in turn would pass it to the conductor of the train that picked up the empty. In Harry Dolan’s account of waybill preparation (cited in the second paragraph of this post), he mentions that a clerk preparing paperwork for an empty private car would check the file to see if there were any instructions by that car owner. The document above is the kind of thing that would be in that file. Whether one might wish to include some such document in model layout operations is an interesting question. Certainly any major yard on a layout could handle private cars with such documents, perhaps as part of a yard clerk or car distributor duty. Such a person would find out where to send a private empty by having documents of this kind on hand at the yard. Note, however, that this document is not meant as an Empty Car Bill to actually move the car, only to direct where it goes. Most railroads used an Empty Car Bill as the paperwork for such movements. (I discussed that paperwork in a previous blog post, and if you wish, you can read it at: http://modelingthesp.blogspot.com/2011/06/waybills-8.html .) Thus a yard clerk, prototype or model, would have to prepare (or select from a file) an appropriate Empty Bill for the car, once Instructions like those above identify the destination. 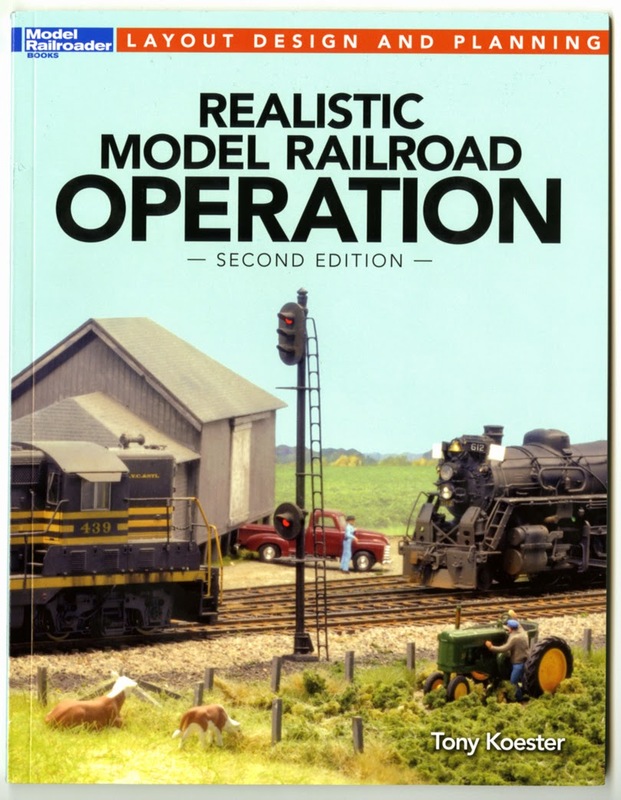 In a previous post, I commented on the recent Second Edition of Tony Koester’s Kalmbach book, Realistic Model Railroad Operation (you can see that post at: http://modelingthesp.blogspot.com/2014/03/tony-koesters-recent-operations-book.html ). Within that post, I also praised Bruce Chubb’s book, How to Operate Your Model Railroad, first published in 1977, a large and immensely informative book which is no longer in print. This issue is still available for purchase, direct from Kalmbach, at this link: http://www.kalmbachstore.com/modeltrains-railroading-model-railroading-special-issues-model-railroader-magazine-special-issues.html . It costs $7.95, and I would definitely recommend it. 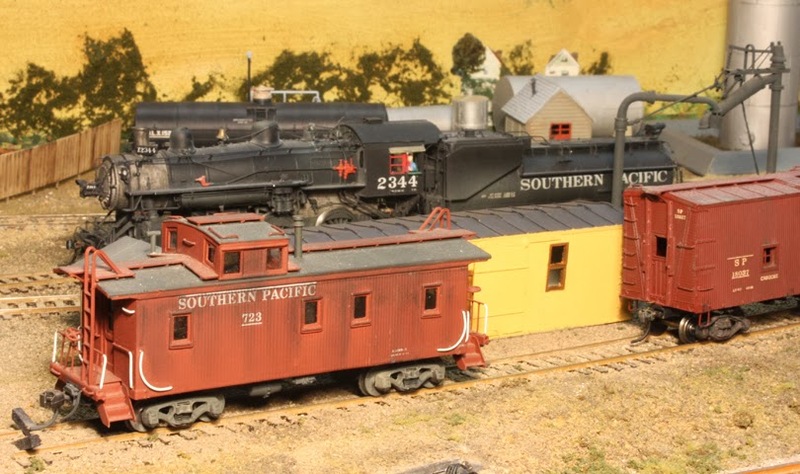 A number of the pieces in it, by Andy Sperandeo, were drawn from his column in Model Railroader, entitled “The Operators,” and others come from a variety of past articles in the magazine. One could thus say that it is in large part a collection of previously published material; still, having it all in one place is convenient, and I think that in this form, its impact is greater than the sum of its parts. In my opinion, overall, it is a valuable and very readable publication. I can recommend it in particular for its compact presentation of the basics of model railroad operation, especially if you don’t know too much about the subject already. I recently posted a description of the tank car fleet of the Associated Oil Company (at: http://modelingthesp.blogspot.com/2014/02/associated-oil-company-tank-car-fleet.html ). That description was intended only as an overview of the fleet, both while it was operated solely by the Associated Company, and after Associated’s merger into the Tidewater Associated Oil Company, which became complete in 1936. For the historical background of this merger and the companies involved, I have written a summary post, available at: http://modelingthesp.blogspot.com/2013/12/associated-oil-company-background.html . 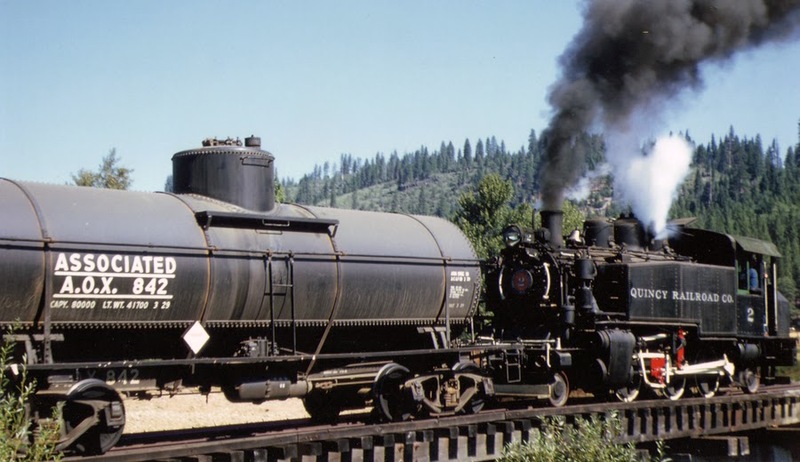 I recently heard from Tom Dill in Oregon, letting me know he had a slide of an Associated tank car, taken on the Quincy Railroad in California about 1956. With his permission, here is that image, conforming entirely to my description of the paint and lettering of Associated cars in this period (see Part 1 on this topic, cited in the first sentence above). It's an 8000-gallon, three-course tank, with an underframe which is an American Car & Foundry Type 25. Note the 3-29 reweigh date, the same as the built date, though the tank specification is stenciled as ARA Spec III (superseded in 1927 by ICC specifications, but stenciling on this point is not always accurate). The placard is an “inflammable” placard, so the car is evidently loaded. 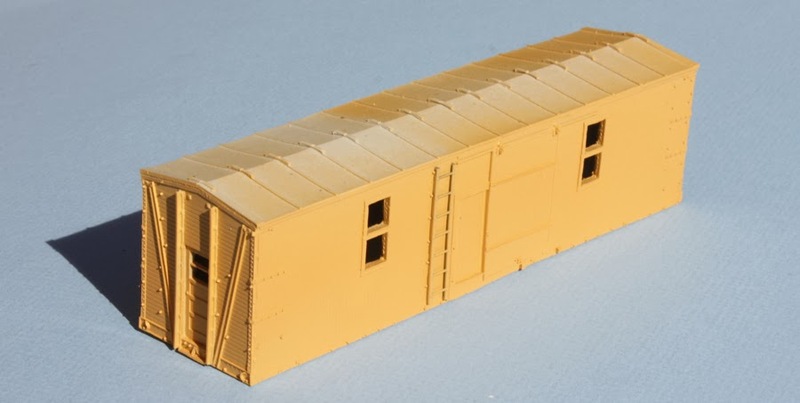 The Type 25 underframe is essentially a Type 21 without side and end sills, so could be kitbashed from one of the commercial AC&F tank car kits, a project I am now planning. One of the noteworthy features of the Associated car fleet was the 300 cars of Common Standard Class O-50-2, received in 1906. Most of these cars were gone, sold back to SP or otherwise disposed of, by the early 1920s, but a few continued in use. 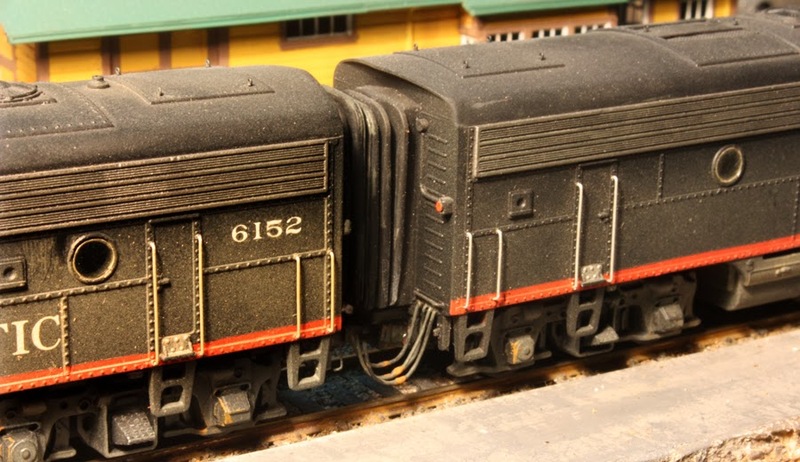 There were still two of those cars listed in the Official Railway Equipment Register for 1953, when I model! I showed a photo of an SP Class O-50-2 car in my post about the Associated fleet, cited in the first sentence, above. I had never seen a photo of one of those cars in service, however, and recognized that such a photo might not exist. But in Tom Dill’s photo collection there is an image which proved me wrong. 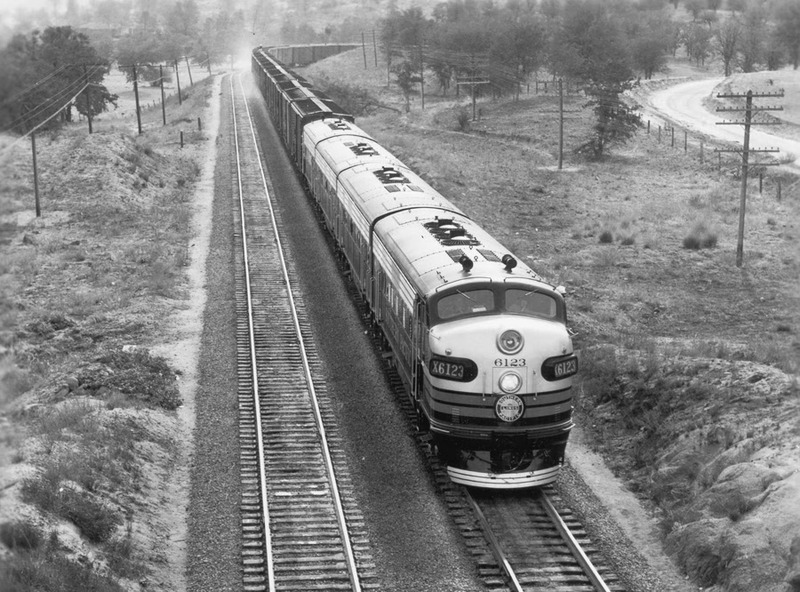 The photo was taken, I am pretty sure, to record the locomotive at the head of the train, Extra 5010 East, one of the huge, noteworthy 4-10-2 three-cylinder engines purchased by Southern Pacific during 1925 to 1927. The entire image, taken at McCredie Springs on Oregon’s Cascade line, looks like this. 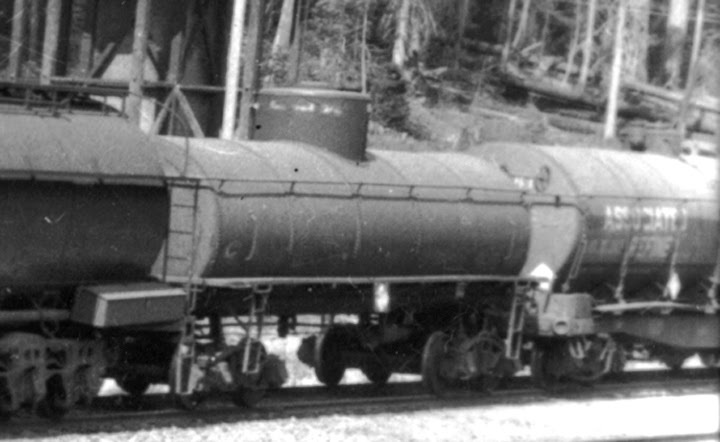 At the right edge of the image are two tank cars, and the further one is an extraordinary sight: one of those distinctive Common Standard tank cars, in Associated service. Here is an enlargement; you can click on the image to enlarge further. I can’t make out a car number, but the “Associated” name is quite clear. This does document one of these cars in Associated service, and the photo can be no earlier than 1925, when engine 5010 was delivered, by which time there were rather few of the old 12,500-gallon cars still on the Associated roster. Such a car cries out to be modeled, but there is no brass or plastic car of this type available. One possible stand-in, though, is the CS-25A tank car made in HO scale brass by Westside years ago, a somewhat similar-looking car. I will have to think further on this. 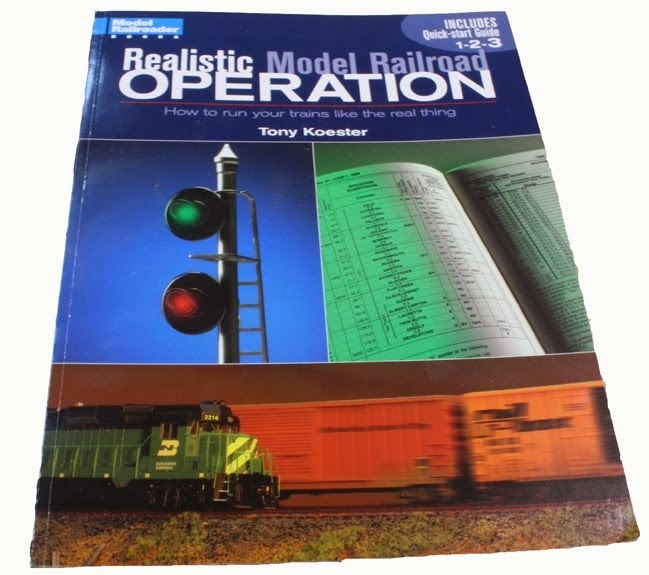 In 2003, over a decade ago, Kalmbach issued a new book on model railroad operations, authored by Tony Koester and entitled Realistic Model Railroad Operation. Although it contained rather less than half as much material as its predecessor, Bruce Chubb’s masterful Kalmbach book from 1977, How to Operate Your Model Railroad, the new book contained much better model photography and had the quality writing we have come to expect from Tony Koester. 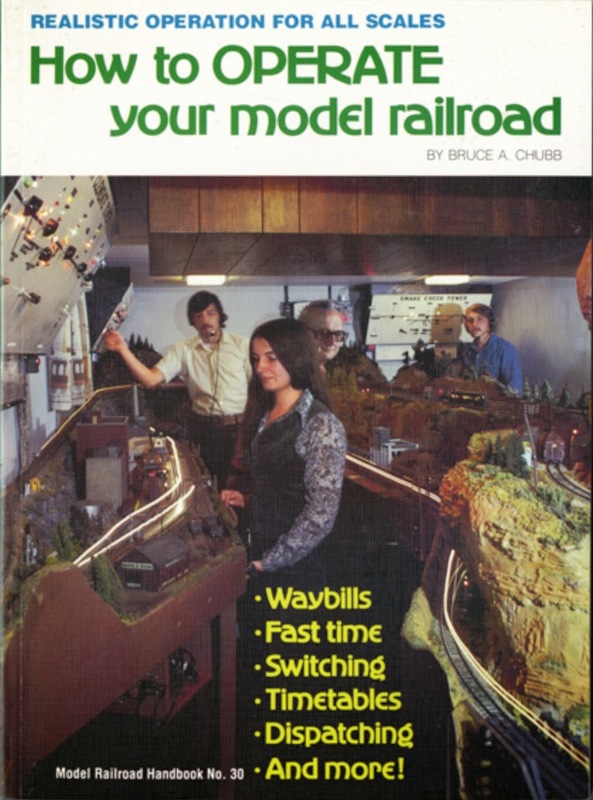 And of course it reflected the many changes in model railroading since 1977. Still, I continue to urge those beginning to learn about operation to obtain a used copy of Chubb’s book, just because it is so complete and informative. Here is the cover of the Chubb volume, which as I said is well worth acquiring if you don’t have a copy. What replaced Chubb’s book in the Kalmbach universe, what you might call a summary version of the material, authored by Tony Koester, was designed by Kalmbach partly to get this title into the style, size and price point of their other softbound books. One could criticize the reduction in content, but the book was probably a great help to many, simply in that it was much briefer and illustrated with photographs from a range of model railroads, while maintaining the definite connection to the practices of the prototype which Chubb had emphasized. But just as one could recognize in 2003 that many things had changed since 1977, the same was true in 2013 since 2003, and Kalmbach again asked Tony Koester to re-do the book. Last spring Tony completed work on an updating and revision of the book contents, and it was issued as the Second Edition of the same title. The new version captures many new ideas and approaches, while replacing a few older aspects of the topic. The new volume nicely encapsulates, among other things, all the changes in thinking about waybills in model railroad practice, in a new Chapter 7. Tony has generously given credit to many of those who have contributed to these ideas, including me, and I think his presentation in that chapter is sound and complete (as is the whole book). The new edition will be a welcome discovery to those not yet involved in operation, and is likely to have a few thought-provoking sections even for the experienced operator. I warmly recommend it. 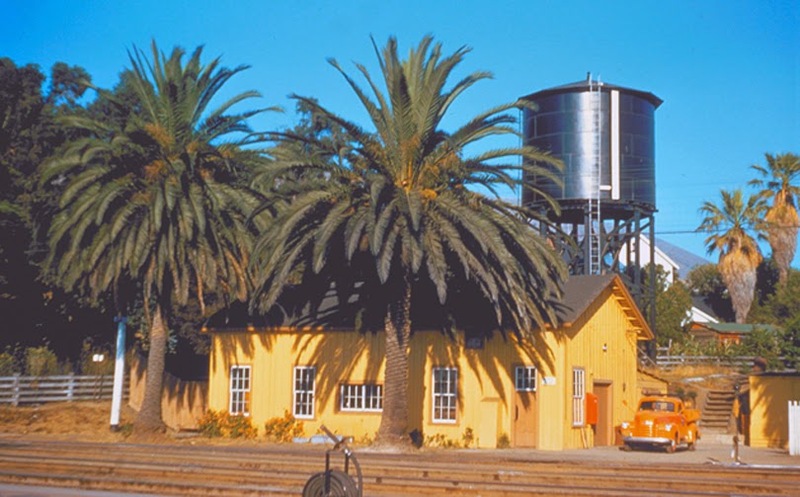 Southern Pacific marked mileposts along its routes, ordinarily by a number sign, giving the miles distant from San Francisco. This sign was mounted on the telegraph pole nearest to the milepoint, if that was convenient; otherwise a separate wood post would be used. There is a standard drawing for these signs, printed in Volume 2 of the Southern Pacific Lines Common Standard Plans series (Steam Age Equipment Company, Dunsmuir, CA, 1993), which I reproduce below. The numerals are the Egyptian characters standard for SP signage; a drawing for those characters is included in the same Volume 2 just cited. A number of details in this drawing are interesting. Note that a two-sided sign was the normal arrangement, and is shown at upper left attached to a telegraph pole. This drawing has a 1979 revision date and thus does not mention sheet-steel signs, but signs of that type, with impressed numerals, were once common on the SP. 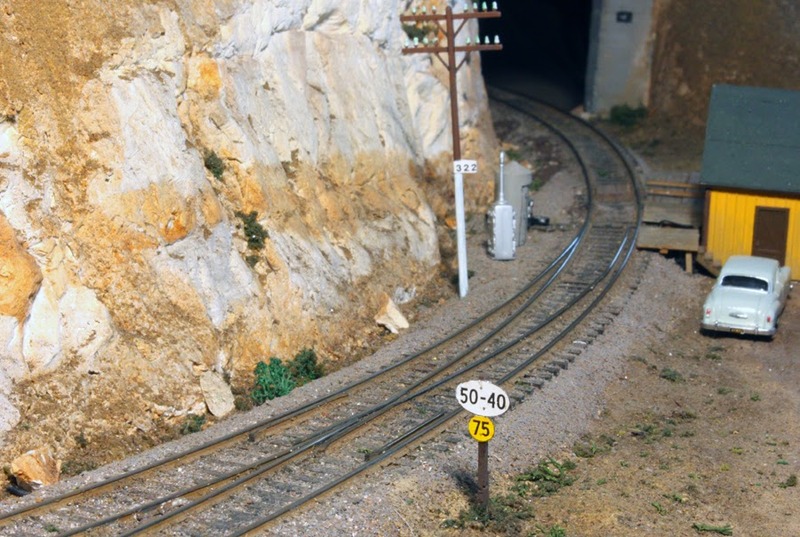 My layout in Pittsburgh, PA included both the depot and turntable at San Luis Obispo. Years ago, I was approached at a convention of the Southern Pacific Historical & Technical Society and asked if I would be interested in purchasing the SP milepost sign for San Luis Obispo, mile 252. I immediately asked, “how did you come by it?” and was told, “never mind that, do you want it?” The price was pretty reasonable, so I said yes, figuring I could take care of it, and eventually donate it somewhere. Now that a railroad museum is opening in San Luis itself, I believe the sign needs to go there. 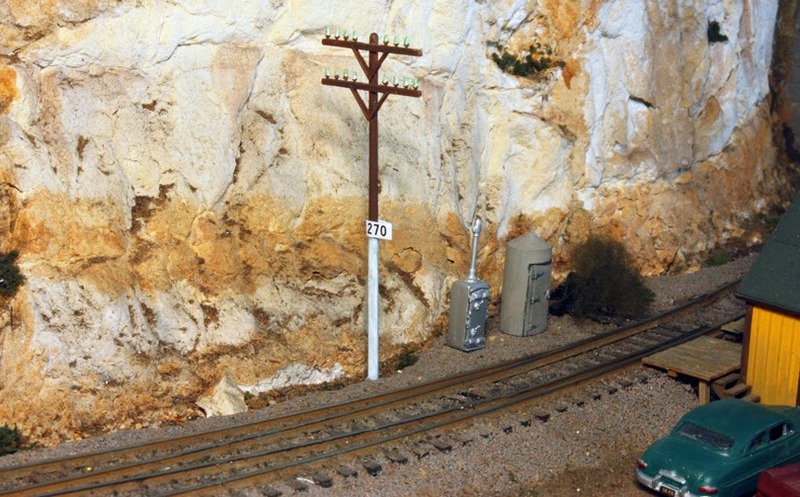 The telegraph pole which the 252 sign was mounted was adjoining the Signal Dept. building across from the San Luis depot. Here is an Alden Armstrong photo of that building in the early 1950s; the white-painted milepost pole can be seen toward the left edge of the image, and the mile sign itself is just visible at the top of the white portion. The signs were mounted 10 feet above the railhead, and the mounting post was painted white to that height. 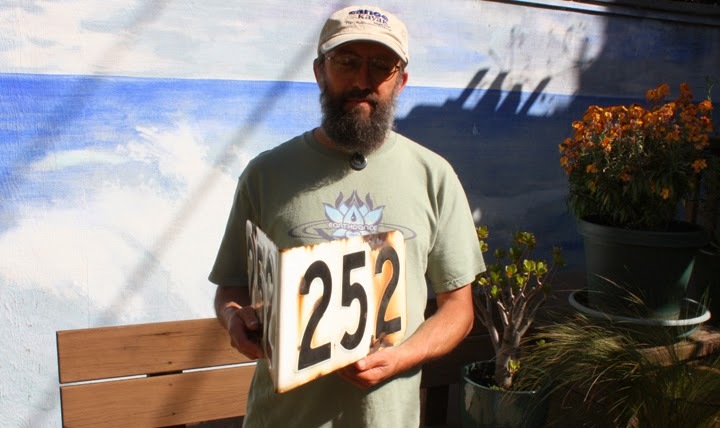 Below I show a photo of my son Campbell holding the San Luis 252 sign itself. Its dimensions evidently represent an earlier version of what is called out on the drawing above; its numerals are 6 inches high, the sign 8 inches high. You can see the two sides of the steel sign, which is porcelain enamel white with black Egyptian numbers on the outside, and some rust staining from the nail holes. The impressed numerals are evident in this view of the inside of the steel sign. My layout location of Shumala is just beyond milepost 270, so that number was the one to mount on a model telegraph pole just west of the depot and the Chamisal Road crossing. The location, near a section building, is the same as shown in my previous post about speed signs (you can read that post at this link: http://modelingthesp.blogspot.com/2014/03/speed-signs.html ). I chose to use the slightly larger sign dimension shown in the drawing at the top of this post, that is, a 12-inch sign height, which amounts to almost exactly one-eighth of an inch when reduced to HO scale. I just reduced the digital Egyptian numerals of the sign to that size and printed it on paper. Here is the result. 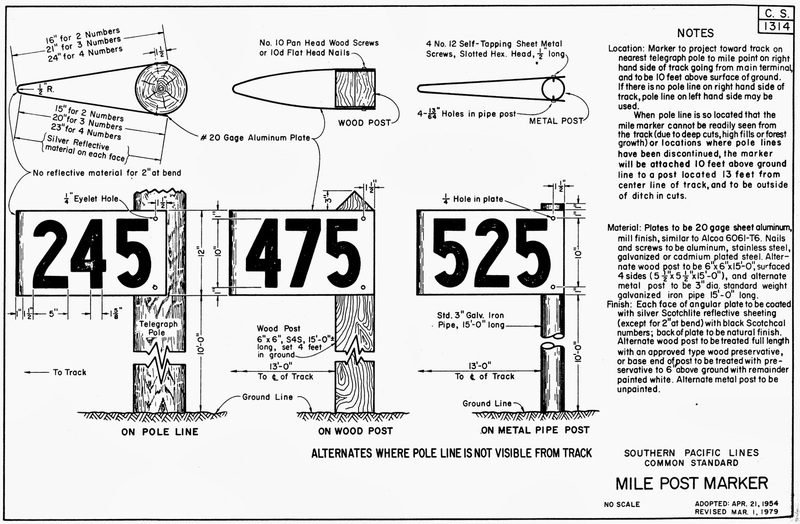 As I stated in my comments on speed signs, cited in the preceding paragraph, these milepost signs are distinctive trackside features of an SP main line, and any representation of an SP main should include milepost signs. Among the many items of Common Standard signage on the Southern Pacific were speed signs, as the railroad called them. These were simply speed limits. The same information was included in employee timetables in the form of Special Instructions, but the signs were reminders at trackside. 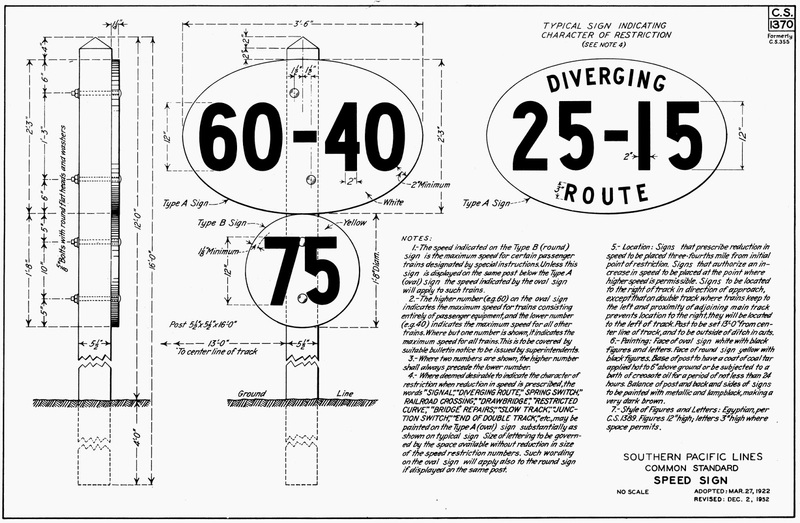 A 1952-era drawing for the standard speed sign, from the Fred Hill collection, was printed in the Southern Pacific Historical and Technical Society (SPH&TS) magazine Trainline, issue 23 (undated, but approx. 1989). I reproduce it below. There was a 1972-era drawing in Volume 2 of the Southern Pacific Lines Common Standard Plans series (Steam Age Equipment Company, Dunsmuir, CA, 1993), but that 1972 version does not include the “streamlined equipment” sign (round Type B) which is appropriate for my 1953 modeling. You can click to enlarge, and download if you like. As the drawing explains, the oval sign with two numbers has the higher speed for trains with all passenger equipment, the lower speed for all other trains. The Type B sign applies only to streamlined equipment. You can buy this back issue of Trainline, should you wish to do so, from the SPH&TS website, at this link: http://www.sphtsstore.org/servlet/the-Trainline-back-issues/s/17/Categories . To model this sign, I simply reduced the image to HO size (dimensions are given right in the drawing), and applied it to a post. I used the Guadalupe Subdivision instructions from the 1953 timetable to choose the speeds on the sign. One can readily change the numerals to suit conditions, either from the drawing above or from the Egyptian lettering drawing in Volume 2 (citation above). [Digital versions of Egyptian are available on the internet.] Note on the drawing that the round Type B sign is to be yellow, the oval sign white; I applied the yellow color with a felt-tip highlighter pen. Here is my model sign, on the SP main line near my town of Shumala. On the telephone pole across the track, the white paint and the number sign designate a milepost sign, though this particular milepost number is not correct for my present layout, and will have to be changed (probably I will write a post about mileposts when I make the correction). And in the far distance, a black rectangle on the side of the tunnel portal contains a white tunnel number, standard SP practice. 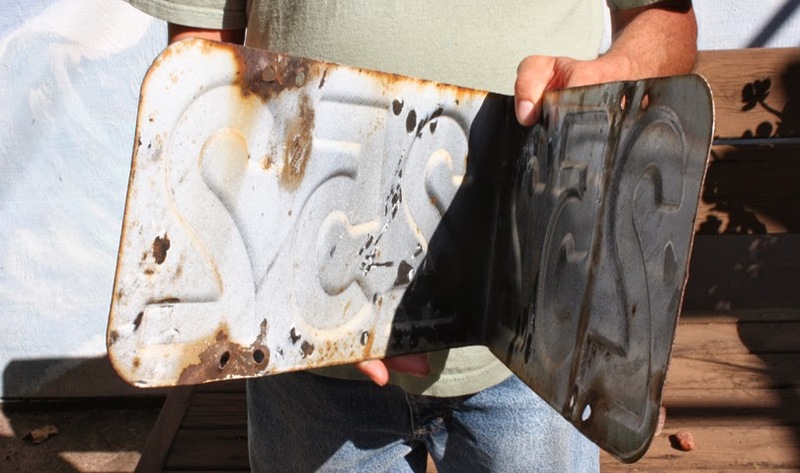 Trackside signs are sometimes neglected, but they should be part of the trackside scene for Southern Pacific modeling. I posted recently a brief description of my column for the March 2014 issue of Model Railroad Hobbyist, presenting my model of an oil dealership. The post can be seen at: http://modelingthesp.blogspot.com/2014/03/associated-oil-co-modeling-oil-dealer.html . I received an off-line comment to the effect that I should have shown tank cars spotted on the oil dealer’s spur, and indeed I did take photos of that kind, but didn’t include them in the column. They are shown below. I also realized upon re-reading the column as it was published, that a correction I made at the proof stage did not make it into the final magazine version. On page 17 of the column (MRH paginates each part of the magazine separately), at the end of the paragraph about my pump house, the concluding sentence is pretty garbled. Here is what it should say: “The McGraw Oil kit provides small brick structures for the office and the pump house; this style of building may be fine in the east or midwest, but would not be typical in the west.” How the MRH editor(s) arrived at what was finally published escapes me entirely. In this photo, foreground oil and water columns can be seen, which are part of the Shumala engine terminal and have nothing to do with the Associated facility. Shipments of propane likewise can arrive in Tidewater Associated fleet tank cars, or in leased cars. Here is a California Dispatch Line (CDLX 1528) tank car doing that job (the model is the recent Atlas LPG car). It is of course spotted at the unloading platform for propane. In addition to tank cars as the most common visitors to this Associated dealer, an occasional box car with packaged petroleum products would be spotted at the warehouse loading dock, though I have not photographed such a car spot. The purpose of the oil dealer model is partly to establish a scenery segment, but more important (to me) is that it is a switching destination. So as I see it, these photos show my model of an Associated bulk oil dealer performing the role that I designed it to do. 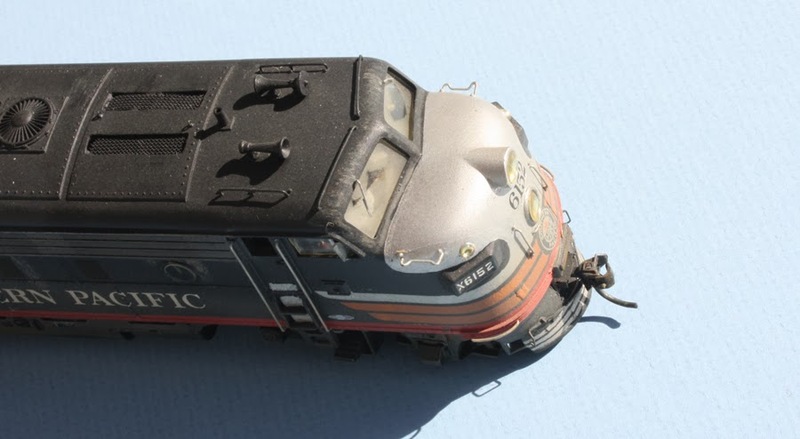 My background post on SP EMD F-unit diesel locomotives provides prototype and also modeling information across the entire topic (you can read it at: http://modelingthesp.blogspot.com/2014/02/southern-pacific-f-unit-diesels.html ). In this and a future post, I will describe an older pair of models of Southern Pacific F3-A and B engines, and how they have been modernized. The view below is at Rowen, on the north slope of Tehachapi, and it shows enough of the roof of both the leading A and B units that the dynamic brake slots are evident (Southern Pacific photo N-1640-13). 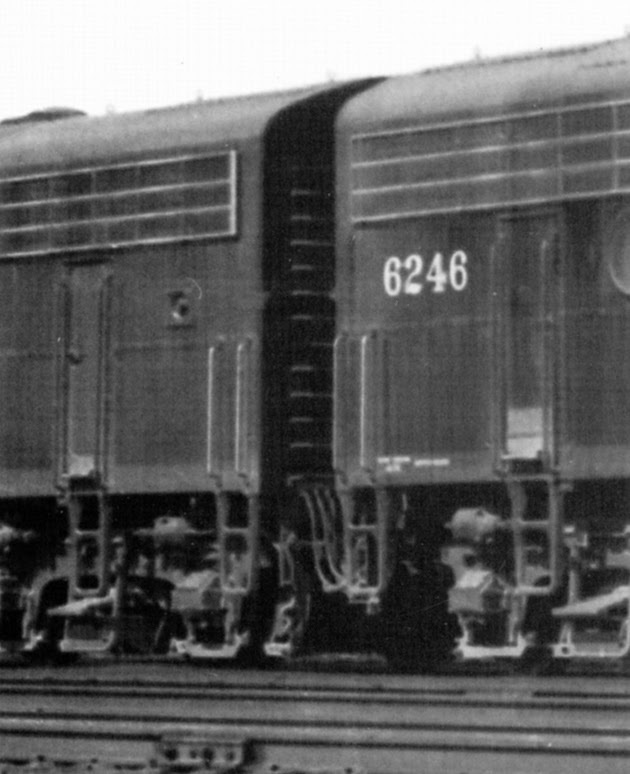 The photo dates to 1948, when the units were brand new. You can click on the image to enlarge it. 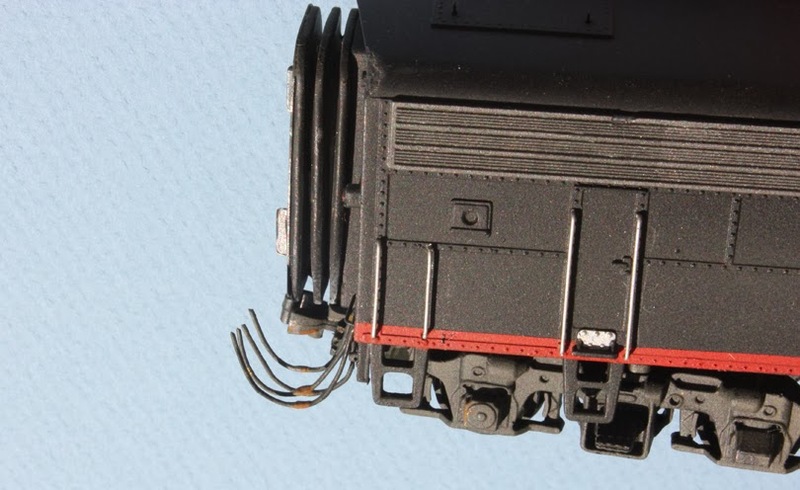 On my models, I smoothed off the appropriate roof panels, including the steam generator parts on the rear hatch (SP did not own any F7-A units with steam generators), and cut slots for the dynamic brake openings. The slots were filled with screen. I drilled out the exhaust stacks so they would be open, installed diaphragms, and added lift rings as needed, plus railings above the cab windows. The result was like this. The B unit roof was done the same way. On the A unit, I added all needed grabs on the nose area, installed headlight lenses, and represented a somewhat dirty windshield with wipers by the simple expedient of cutting a masking tape shape like the wiper path, putting it on the windows, then overspraying with Dullcote. Wipers are wire. A side view of the unit shows another feature I thought was worthwhile with the old Athearn F-unit: creating flush window glazing, because the old Athearn body molding is so thick. I did this by making a punch tool from 7/32-inch OD brass tubing, and filing the inside of the tube until the circumference just matched the outer part of the window opening on the Athearn unit. I then used the punch to cut discs from clear plastic, filed the edges smooth, and attached them to the unit with canopy glue. One other feature I wanted to try and reproduce was the hoses between units. These are not very obvious in most photos, but in some views they can be seen. This detail from a Wilbur Whittaker photo shows what I mean. I discussed this point in my modeling column in the SPH&TS magazine Trainline, issue 45 (like most back issues, still available from the Society; see http://www.sphtsstore.org/servlet/the-Trainline-back-issues/s/41/Categories ). My modeling approach for this was to make wire loops to attach to the B unit, with glue thickening at the loop bottom to represent connectors. When the two units are coupled, the wire appears to join to the A unit, but the units can negotiate tight curves or switchwork without interference between units. The models then looked like this when on the track. Note that, despite my efforts to reduce it, the inter-unit spacing is still pretty large compared to the prototype. The diaphragms do help fill the gap. As I said, the old Athearn F unit bodies have really too flat a roof contour, but as long as I keep these Athearn A and B units together, and don’t try to mix and match them with more accurate models, it really isn’t obvious in a passing train. But although my other Athearn F units are Genesis, I still respect these old campaigners. My column in the newest issue of the online magazine Model Railroad Hobbyist (available free like all issues of MRH at http://model-railroad-hobbyist.com/ ) is about modeling a bulk oil dealer. My starting point was a series of photos of prototype oil dealers I have been taking for years. That information in turn was my basis to kitbash and rearrange a Walthers McGraw Oil kit, adding some scratchbuilt components, to create a realistic model. The article naturally also includes elements from my prior blog posts about Associated Oil history (which you can read at: http://modelingthesp.blogspot.com/2013/12/associated-oil-company-background.html ) and Associated tank cars (available at this link: http://modelingthesp.blogspot.com/2014/02/associated-oil-company-tank-car-fleet.html ). In fact, some of the background research for those two posts was done with a model of a bulk oil dealer in mind. This Associated oil dealer is just one of the oil depots I plan for the layout. I already have a small Union 76 dealer, modified from a Chooch kit, which is shown in a photo in the MRH article. I will also add a Richfield dealer and possibly also Chevron if I have space. If the article is of interest, it is on the March 2014 issue of MRH. 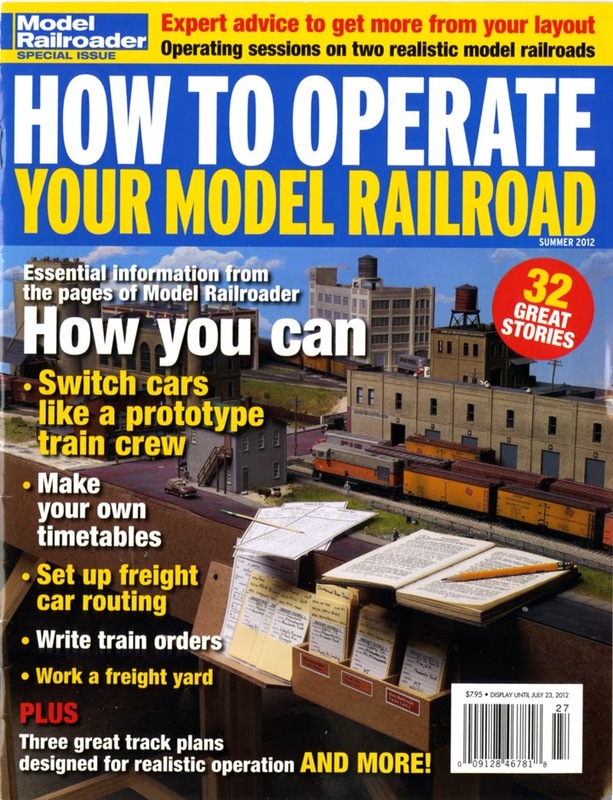 To obtain it in various formats, go to: http://model-railroad-hobbyist.com/magazine/mrh-2014-03-mar . Modelers often neglect them, but a familiar sight alongside the right of way of any railroad were section facilities, ranging from handcar sheds to tool houses, bunk houses, and other facilities needed by track crews. Of course SP is no exception. In the past, I collected various model manufacturers’ small railroad sheds and painted them for SP, but today there is no reason to do that. 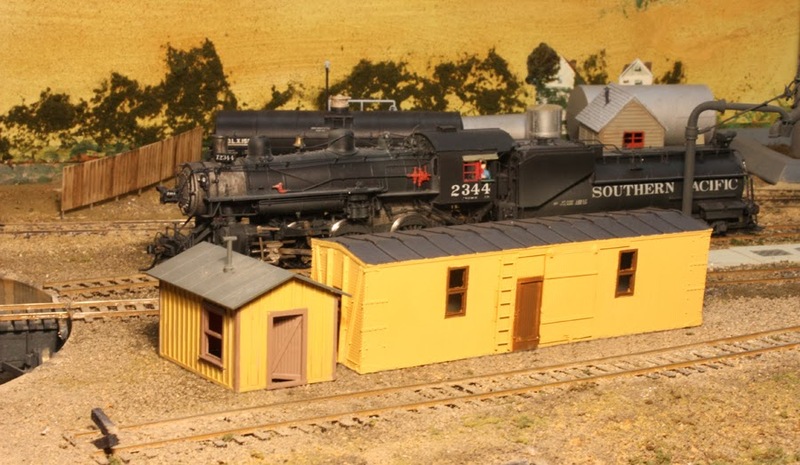 The fine kits for a variety of SP tool and handcar sheds from Bruce Barney’s AL&W Lines quickly and easily assemble into fine and accurate models of the buildings we want, and I will show one of those kits assembled below. (You can see the entire line at their web site, at: http://alwlines.com/spstructures.html , including several small depots.) But one may have a particular prototype service building in mind, which is not exactly a tool house, and variations on this theme are easily built from scratch. I will show one of those below also. My shed kit is AL&W kit No. SP3, the “large” tool house with drop siding. Like all such laser-cut buildings, it is easiest to paint all the walls and trim before assembling the little building. My larger section building is proportioned just like the tool house just shown, particularly duplicating the roof pitch, and is intended to be situated right next to it, so it should have a family resemblance. I simply used Evergreen Novelty siding, material no. 4083, and laid out larger sides and ends than the AL&W tool shed. Here too, I airbrushed the walls Colonial Yellow before doing any assembly. Here are all wall parts freshly airbrushed with Tru-Color’s version of this standard SP color (Tru-Color no. TCP-153). The four parts in the top of this photo are the AL&W parts from kit SP3, the lower four are the styrene parts for my modified section structure. It has no front wall, since that aide will face away from the layout edge. Some tool houses had side windows, but by my observation, many did not (possibly for security reasons). The AL&W “large” tool house does not have one either (it’s taken directly from a prototype). In the larger of my new styrene versions, I put a single horizontal-sliding window, using Grandt Line part no. 5081, as you can see in the photo above. 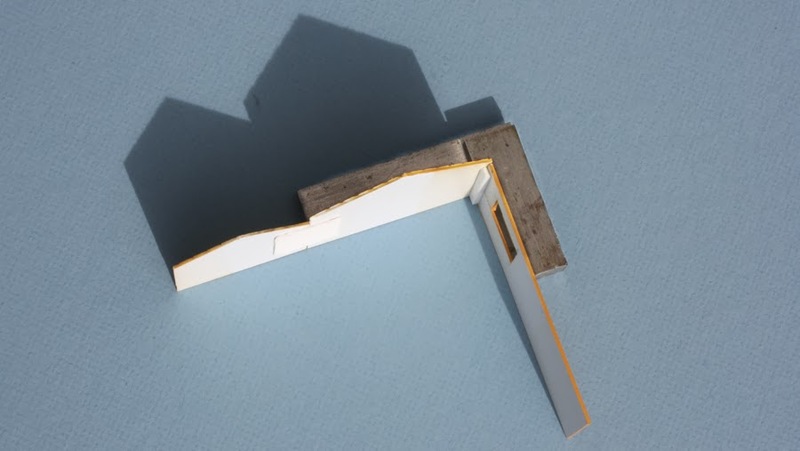 Next I proceeded to assemble the walls of the styrene structure, connecting them with Evergreen styrene strip no. 166, which is 0.080 x 0.125-inch dimension. This makes a solid corner, and I ensure that it is a 90-degree corner by using a small machinist’s square when putting them together. In this photo of the first wall attachment, you can see the scrap piece of styrene sheet used to splice the two ends. After assembling the sides to the building end, I added corner gussets. These are easy to make, and add greatly to the stiffness of a building like this. I just cut a square or rectangle of styrene sheet, checking carefully with a machinist’s square that the corners really are square, then cut it across the diagonal. The gussets are strengthened underneath with more pieces of the Evergreen no. 166 strip. Once those gussets were done, I also added a beam across the front of the structure, using more Evergreen no. 166 strip. Here is a photo of the arrangement from below, so you can see the construction. I also assembled the AL&W kit to this point, using the kit’s very nice peel-and-stick trim. The walls glue neatly to the floor and hold everything square and in alignment. It is a delight to assemble. By the way, the doors should not be brown. I will repaint them Colonial Yellow. Once the structure had reached this point, it was time to undertake the complexities of roofing the double structure. I will describe how I did that in a following post. The AL&W kit roof is uncomplicated but I will defer it also.